It turns out that when you have a lot of "best minds" working on the same problem, you come up with some pretty interesting technology - no matter how inane that problem may be. The technology that those "best minds" at Yahoo came up with to target ads to users is called Hadoop. Hadoop is a powerful technology and like most new IT solutions is being touted at being able to solve a vast number of technical ills. When companies discover that Hadoop will not in fact cure male pattern balding, they will fall into the inevitable trough of disillusionment. Almost all traditional business data fits well into the relational model, including data about customers (CRM), products (ERP) and employees (HR). This data should continue to live in relational databases, where it is much easier to manage and access than in Hadoop. Almost all web data fits well into the Hadoop model, including log files, email and social media. This data would be almost impossible to store in a relational database, not just because of the volume, but because of the inherently nested quality of the data (threaded email conversations, web site directory structures, social media graphs). How many other data types look like click streams? Not very many. How many other real world problems lend themselves to analysis using web data analytic techniques? Also not as many as you might think. This is not to take anything from the Hadoop market opportunity - as more of the world interacts with each other via web applications and devices, more of the world's data will be reducible to click-stream-like formats. The big data craze has taken over the tech media world much like the cloud craze. Most people know it is important but they don't know why. Many vendors get caught up in the hype cycle and start to believe that their technology has some sort of manifest destiny that will allow it to do much more than it can reasonably be expected to do. Traditional data warehouses work on a "pay me now" basis. To get data into the data warehouse - even data that may not end up being useful in any way - you have to massage the data into a formal relational model. This is expensive and the data normalization process itself may make it impossible to get at the data in exactly the way you want to. In contrast, Hadoop works on a "pay me later" basis. Data can be shoved into the Hadoop file system any old way. It is not until someone wants to analyze the data that you have to worry about how to connect all the pieces. The gotcha is that the price you pay in this "pay me later" model is much higher, requiring extensive programming in order to ask each question. In addition, because the normalization process wasn't done up front, it won't be until later that you may discover that you were missing crucial pieces of information all along. Thus it does bear some thinking up front on what sort of data to store in your Hadoop database and what kinds of questions you might want to be able to answer about that data in the future. Realistically, it will take most businesses who implement several years to figure out whether all the data they are dumping into Hadoop produces real value out the back end, just as it was several years before companies started to get a payout from their investments in relational data warehouses. Back in my - very brief - high school shop days, we learned that the trick to making a really nice looking ash tray is picking the right tool for the right job. 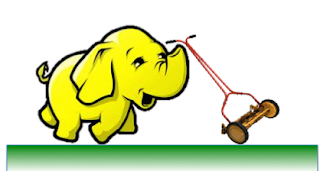 Hadoop is web data query engine that requires a high level of effort for each new query. Relational is a business data query engine that requires a high level of effort to format and load data into the datastore. The fastest way for companies to get into trouble with Hadoop is to try to use it as a one-size-fits-all data warehouse. Much of the news in the Hadoop world today has to do with SQL parsers that run on top of Hadoop data. This is a powerful and valuable technology, but does not mean that you can throw out your data warehouse and replace it with Hadoop just yet.